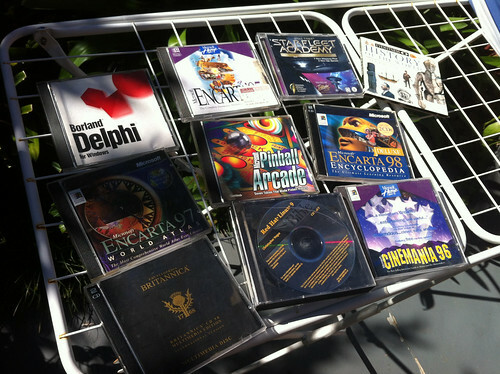 As a child of the 1990s and early 2000s, I grew up with multimedia CD-ROMs. For the time, they were amazing. When drives were counted in the tens or hundreds of megs, a 650MB CD-ROM with text, images, short video clips and sound were amazing. Or perhaps I was just an easily amazed child. The medium was largely extinguished with the advent of fast internet access that facilitated free, widely available and constantly updated material that an optically-powered sneakernet could never hope to match. It’s that inflexibility that continues to fascinate me about the multimedia CD-ROM. With so much of the web being created, revised and lost on a daily (hourly… second?) basis, multimedia CD-ROMs are unashamedly frozen in time. While in the past this was a hindrance to wider adoption, today they can serve as time capsules into how the world was seen during the time they were made. My favourite example: my DK World Atlas 1995 CD-ROM proudly states that “Singapore is the world’s largest manufacturer of floppy disk drives”. This is why I collect them! So, long story short, while waiting for some Indian takeaway to be prepared, my father and I inadvertently stumbled across a second hand music shop. While he was immediently drawn to the shelves and shelves of $1 CDs, I ran to a dusty shelf near the door that was chock full of old computer CD-ROM discs!